If you are planning to make a low budget home recording studio then you might be thinking whether Focusrite 2i2 Studio Bundle is good or bad for your music recording studio? I personally use this audio interface with the microphone, reference headphones, free music making software (DAW- Digital Audio Workstation) and other accessories provided with it, for over 40 months and believe me it records and provides superb sounds quality so far. What comes in box of Focusrite 2i2 Studio Bundle? A Studio quality reference headphones (closed back) which provides flat response and plays the sound as it is recorded or synthesized by software VST plugin. Free VST Plugins like Focusrite Compressor, Bass plugins etc. A 6.3mm to 3.5mm converter jack for connecting the Interface to the normal/smartphone headphones too! Comes with a Paid Professional Recording Software as a freebie, so you don’t need to purchase DAW software separately. There is no fixed type of software, somewhere/sometimes it comes with Protools, somewhere/sometimes with Cubase and Ableton Live too. So, you have to confirm from seller that which software they are providing with the Focusrite studio bundle you are going to buy from them. 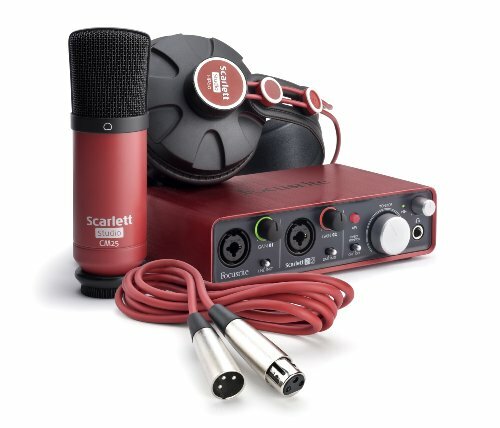 Price of Focusrite 2i2 Studio Bundle in India? Should a Musician choose Focusrite 2i2 Studio Bundle? The answer may vary person to person but, yes, if you are unable to decide the exact models of Audio Interfaces, Microphones and Reference Headphones, then its good choice to go with it! Click here to buy this Studio Bundle now from Amazon. Write below in the comments if you still have questions! Previous post: Focusrite Scarlett 2i2 Set Up! 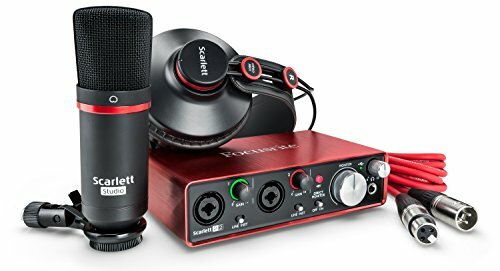 How to Connect Focusrite Scarlett 2i2 to Computer, Audacity, Cubase, FL Studio or Other Recording Software?